The Auspice of Woolen Tents is one of the ten Auspicious Asterisms (as-su’ud). The Arabic term indicates good fortune or something that is auspicious, especially a star. The Auspicious Asterisms are all pairs of otherwise unremarkable stars, except for one that is comprised of four stars. The Auspice of Woolen Tents is the only one of the ten Auspicious Asterisms that contains more than two stars. The Auspice of Woolen Tents appears as a triangle of moderately bright stars with a fourth star located right in the center. 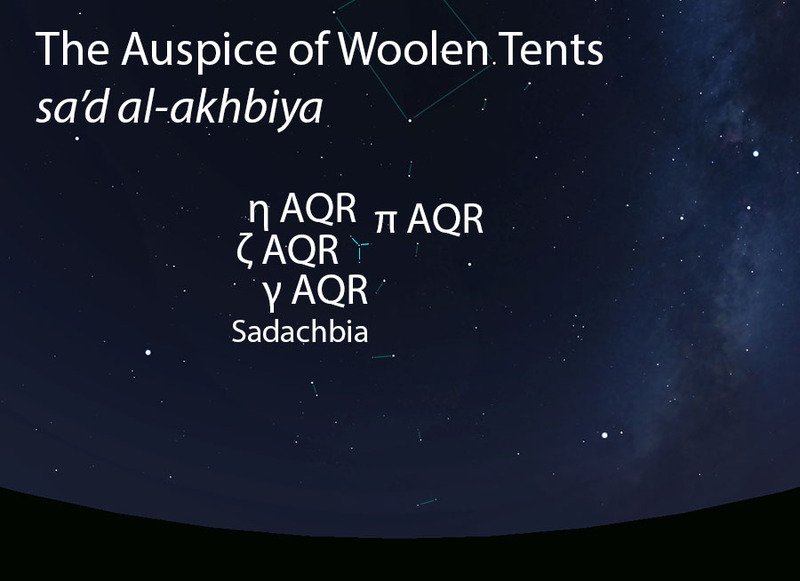 The woolen tent (al-khiba’) for which the 25th lunar station was named was often made with 3 poles that met in the middle, a fitting description of the appearance of these stars in the sky. 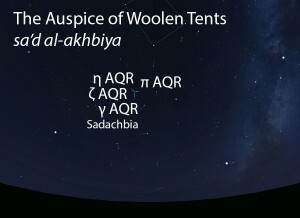 The Auspice of Woolen Tents (sa’d al-akhbiya) as it appears in the west about 45 minutes before sunrise in early August. Sky simulations made with Stellarium. A grouping of four stars in the shape of a small equilateral triangle with the fourth star in the center. In early listings of the lunar stations, the Auspice of Woolen Tents is the 26th station of the year. This was later changed to the 24th lunar station after the stations were adjusted to begin with the vernal equinox. One of the stars of the Auspice of Woolen Tents (γ AQR, Sadachbia) matches the Hindu nakshatra called Shatabhisha. The Auspice of Woolen Tents is part of the Auspicious Asterisms (as-su’ud, السعود) folkloric celestial complex.